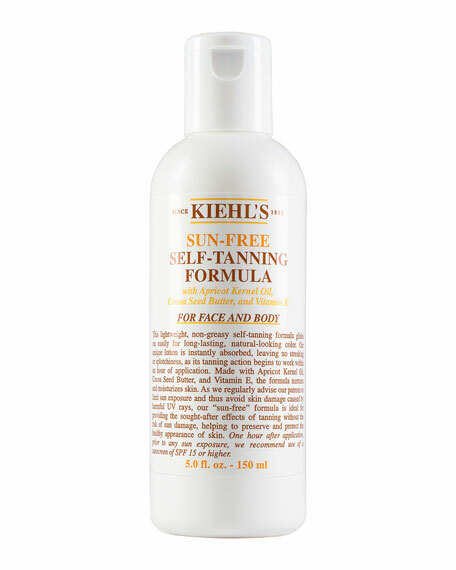 Kiehl's Since 1851 Sun-Free Self-Tanning Formula For Face and Body, 5.0 fl. oz. Kiehl's Since 1851Sun-Free Self-Tanning Formula For Face and Body, 5.0 fl. oz. A lightweight, non-greasy self-tanning lotion for the face and body that glides on easily for long-lasting, natural-looking color. Unique lotion is instantly absorbed, leaving no trace of streaking or splotchiness. Tanning action works within an hour of application. Helps preserve and protect the healthy appearance of skin. Enriched with apricot kernel oil, cocoa seed butter, and Vitamin E to nurture and moisturize skin. 5-ounce bottle. For in-store inquiries, use sku #184429.